September 20, 2017 -- Below is a list of the finalists for the 2017 edition of the Minnies, AuntMinnie.com's campaign to recognize the best and brightest in medical imaging. The finalists were drawn from a list of 208 semifinal candidates in 14 categories, based on nominations submitted by members of AuntMinnie.com. To see the full list of semifinalists, click here. One winner will be selected for each category by our expert panel, with final winners announced in late October. Dr. Stephan Achenbach is one of the 1% -- that is, the top 1% most-cited researchers in clinical medicine in the world, according to Thomson Reuters. A quick search of PubMed confirms Achenbach's prodigious output over the past year; he was listed as either a primary or co-author on nearly 50 studies. Achenbach's area of focus has been cardiovascular imaging, primarily with CT. In particular, he's focused on using the modality for the early detection and characterization of coronary atherosclerosis. He is a founding president of the Society of Cardiovascular Computed Tomography (SCCT), has been involved with the European Society of Cardiology (ESC), and is editor in chief of the Journal of Cardiovascular Computed Tomography. His appointment is as chairman of cardiology at the University of Erlangen, and he has been the recipient of numerous awards, including the Sir Godfrey Hounsfield Award from the British Institute of Radiology in 2016. How many radiologists have a degree in astrophysics? 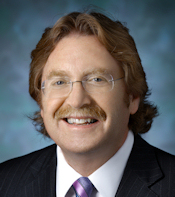 Dr. Bruce Rosen, PhD, does, and that fact goes a long way toward explaining his interest in the intersection of physics and medicine that has led to his selection as a finalist for the Most Influential Radiology Researcher award. Rosen's early training led to a medical degree in 1982, which he followed up with a doctorate in medical physics in 1984. His work has focused on functional neuroimaging, and he authored papers in 1991 and 1992 that are considered to have laid the foundation for functional MRI (fMRI), specifically using the modality to visualize regional activity in the brain. Rosen is currently director of the Athinoula A. Martinos Center for Biomedical Imaging at Massachusetts General Hospital and is a professor of radiology at Harvard Medical School. He has been listed as a co-author on 15 research papers in the past year, ranging from an overview of clinical applications in PET/MRI to rapid fMRI protocols for detecting neural activity in humans. If the Minnies had a frequent flyer program, Dr. Elliot Fishman would be a charter member. The Johns Hopkins University radiologist has won multiple Minnies awards since the competition began in 2000, most recently snagging the prize for Best Radiology Mobile App in 2016 for his CTisus Critical Diagnostic Measurements in CT app. Making the cut as a finalist in this year's Most Effective Radiology Educator category reflects Fishman's tireless work in radiology education, both as a lecturer at traditional meetings and also on his CTisus Facebook Page, where he posts case vignettes and frequently hosts Facebook Live events for the page's over 182,000 followers. One area of Fishman's focus lately has been cinematic rendering, a new data reconstruction technique that produces amazingly lifelike 3D images from CT and MRI data. Fishman sees the technique as taking advanced visualization of medical imaging data to the next level, and it could even play a role in emerging technologies such as virtual reality -- which could be especially useful for medical education. If you attended a radiology meeting in 2017, odds are you've had the chance to see Dr. Keith Dreyer speak. Dreyer, vice chairman of radiology at Massachusetts General Hospital and director of the institution's Center for Clinical Data Science, has maintained an active schedule on the lecture circuit over the past year, from RSNA in November 2016 to the Society for Imaging Informatics in Medicine (SIIM) annual meeting in June 2017. Dreyer lately has been focusing on the intersection between artificial intelligence (AI) and radiology, in particular addressing the commonly held belief that AI will somehow take image interpretation jobs away from radiologists. On the contrary, Dreyer believes that radiologists should embrace AI, and that the technology will enable imaging specialists to deliver better care more efficiently. Dreyer also serves as chair of the American College of Radiology's Commission on Informatics, and he is chief science officer for the ACR's Data Science Institute, established in May 2017 to advance the field of artificial intelligence. Jennifer Chiu is an associate professor in the College of Pharmacy and Health Sciences at St. John's University in New York City. She has been director of the radiologic sciences program at St. John's since 2012. Chiu received a doctorate in education from Dowling College, and she also has an MBA in healthcare management from St. Joseph's College. Her teaching interests are in radiation physics, imaging exposure, and radiation biology and protection. In addition to teaching, her research interests include active learning strategies, simulation, and critical inquiry. Frances Gilman's appearance as a finalist in the category of Most Effective Radiologic Technologist Educator is no surprise, given that the program she directs at Thomas Jefferson University (TJU) was named a finalist in the Best Radiologic Technologist Training Program category in this year's Minnies. TJU also won the category outright in 2014. Gilman believes that radiologic technologists are best served if they graduate with four-year bachelor's degrees, as opposed to the two-year associate degrees that are more common in many radiologic sciences programs. The more advanced degrees give TJU graduates more flexibility and better fit with the recent trend in healthcare toward quality. Gilman's research and clinical interests include interprofessional education and innovative approaches to teaching in the medical imaging and radiological sciences, as well as patient safety and the impact of the changing healthcare environment on educators and hospital-based medical imaging. As regional director of imaging services at Baylor Scott & White Health in Round Rock, TX, Angelic McDonald manages imaging operations for the largest nonprofit health system in Texas. The rapidly growing system earlier this month opened a new cancer center to bring all aspects of oncology care under one roof. McDonald got her start in radiology as an imaging specialist in the U.S. Air Force, and she has 19 years of experience in medical imaging management. She recently joined Baylor Scott & White after managing the cardiovascular imaging operations at Houston Methodist DeBakey Heart and Vascular Center for three years. Prior to that, she managed imaging operations at a number of facilities in the Houston area. McDonald is active in the AHRA and was elected president for the 2017-2018 term after serving on the association's board since 2015. Also a Minnies finalist in 2016, Charles Powell for the past 15 years has been involved in managing medical imaging operations at Emory Healthcare in Atlanta. Currently vice chair and executive director at Emory Healthcare, he manages radiology operations at 20 Emory locations in Georgia, ranging from clinics to hospitals. He was named a vice president at Emory in June. Powell entered healthcare in 1993 after serving in the U.S. Air Force. He directed support services at Emanuel Medical Center in Swainsboro, GA, and then worked for four years as group director of medical imaging at healthcare provider HCA. He received his doctorate in leadership and change in 2014, and in November 2015 he was named an adjunct assistant professor at Emory University, where he conducts learning sessions and provides coaching on leadership development and change management. The University of California, San Francisco (UCSF) frequently appears at the top of any list of the premier radiology residency programs in the U.S. UCSF won the Minnies award for Best Radiologist Training Program most recently in 2006, and it has appeared as a finalist several times since then. UCSF's diagnostic radiology resident program offers multiple opportunities for residents, not only in patient care but also in active basic science and patient-centered research training. Led by director Dr. Soonmee Cha, the residency program touts its track record in training graduates who go on to serve in leadership roles in academic radiology, including as medical school deans, department chairs, journal editors, and principal investigators. Despite its storied track record, UCSF is hardly a department resting on its laurels. It recently opened a new campus in the Mission Bay neighborhood of San Francisco, with new radiology facilities a major part of that expansion. And the department's main facility at Parnassus Heights is in the midst of a major renovation designed to enhance the patient experience. The University of Wisconsin (UW) was a bit of a surprise finalist in this year's Minnies awards, but the university's rising profile could be attributed to several factors. For one thing, the department's own Dr. Perry Pickhardt was selected as the Most Influential Radiology Researcher in the 2016 Minnies. Also, UW researchers have contributed to a number of important papers over the past year, including guidelines for gadolinium MRI contrast use, research into breast MRI screening, and the use of PET/CT to detect signs of Alzheimer's disease. The university's ranks were bolstered recently by the arrival of Dr. David Bluemke, PhD, formerly chief of radiology and imaging sciences at the U.S. National Institutes of Health (NIH) Clinical Center and the newly appointed editor of Radiology. Meanwhile, UW radiologist Dr. Jeffrey Kanne was selected as the first "champion" by the American College of Radiology for its Choosing Wisely campaign to reduce unnecessary imaging. UW's radiology residency program is led by Dr. David Kim, with eight residents per year being trained in the program. The department of radiology is led by Dr. Thomas Grist.